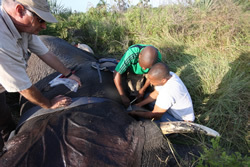 Although we no longer have any collared elephants, 2014 was a fascinating year of study. We witnessed giant gatherings of 150+ elephants around the Roof of Saadani on several occasions, and twice young calves became lost in the melee. One lucky calf was picked up the following day by its mother and her herd, the other was not so lucky, and we found it dead ten days after seeing it lost for the first time. We have been able to follow the Bibi Titi and Raggy kinship groups regularly, even without collars. We are starting to observe a drop in the number of male consorts with our breeding groups which is an indicator of improved security among the elephants. We are also observing them in smaller family units more frequently, which again suggests reduced levels of fear. This is good news in light of the poaching problems elsewhere in Tanzania. Our favourite kinship groups are regulars in the area around the Roof and Bab’s Camp, crossing frequently onto Elephant Island to feed in the latter months of the year, after heavy rainfall. The consistent behaviour of the herd movements has become one fascinating focus of our studies. We have a permanent camera trap set at one point in the South of our conservancy and have recorded elephants crossing the point 42 times during the year. Every single time the animals crossed South to North. In total, as many as 200 individual elephants were involved in those 42 crossing, from individual bulls to large clan gatherings. All passed the same way! This suggests a remarkably disciplined use of trails in the area and we are now looking closer at other key trails to try and work out why the elephants should be so particular. One worrying development in recent years has been the decline and now virtual disappearance of our wildebeest population. Census indications suggested there were as many as 5000 animals 10 years ago; there are now just a handful. It was always unlikely to have been poaching or disease which caused the decline because there has been no evidence on the ground by way of carcasses, or obvious decline in other species which may be vulnerable to poaching. A dead wildebeest carcass found in 2014, on the main North-South highway from Chalinze to Segera has left us speculating that there is a migratory route still open between Saadani and the Maasai Steppe. If wildebeest are using this, and perhaps finding themselves trapped on the Western side because of the expanding human population, elephants may well be still using the same trail and suffering a similar fate. Our elephant corridor focus has always been on a path following the Wami River West. One collared bull, Charlie, all but proved the existence of that route, and the need to unblock it around the main highway. The corridor heading North-West out of Saadani could be very important for several species and needs to be studied. In 2015, we will begin collecting evidence from communities around animal crossing points on the main road. 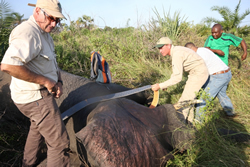 We will also attempt to gather funds to collar more elephants, and perhaps other species, so as to test the viability of this route and to try and keep it open. Our efforts to establish corridors from Saadani to other protected areas have felt a little futile of late. We have all been understandably preoccupied with the massive wave of poaching which has sent numbers tumbling in Selous and other parks and reserves throughout the continent. 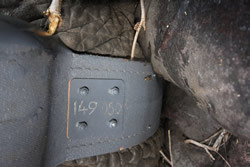 Luckily, Saadani has, so far, escaped the onslaught and we could say is blessed with having elephants with small tusks. In light of the current situation, this could be the most significant thing we have discovered. Not much use discovering elephant corridors and worrying about a dwindling gene pool if poaching is likely to see off entire populations in less than a decade. It is likely that the Saadani elephants were some of the first to feel the force of modern weapons. The park has been visited for 1400 years and was a significant coastal trading post from the 17th century. 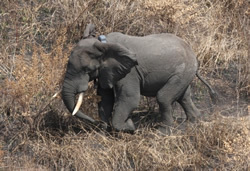 Its elephants would have been amongst the first to be hunted for both sport and ivory, and it appears the weaker toothed line has prospered over the large tuskers. Massive females, in particular, have noticeably smaller tusks than in any other park in East Africa. The small population in Saadani has been much more stable in recent times than many in other parks, there is a very high percentage of young animals, and they may have the best adaption possible for survival - little or no ivory! The current poaching crisis is not the first and international outrage is likely to bring the funding to arrest the situation before it is too late. We should not take anything for granted at this stage but most of the world's governments are now aware of the size of the problem, and pressure is being brought to bear where necessary. It, of course, remains the case that some populations have been wiped out and others taken to the brink of extinction, but with concerted effort, many elephant populations, including Selous, can recover quickly. We will continue our work to establish protective corridors, because the Saadani population remains strong and is in need of dietary supplements as well as access to other elephant herds. The most likely connection has always believed to have been with Wami-Mbiki, a wildlife management area flanking the western reaches of the Wami river which flows into Saadani National Park and the Indian Ocean. Wami-Mbiki needs its status elevating to national park, if possible, to provide it the funding to offer a safe haven to migrating animals. There is a lobby for this and we are part of that lobby. With a secure Wami-Mbiki, we are convinced a wildlife corridor can be re-established with Saadani, and it is our intention to collar further bull elephants in 2014, to discover blockages in the old corridor and to work with communities to re-open them. If you have read some of the earlier reports, you will have noted that Charlie, one of our collared bulls, travelled 50km from the coast, to within 12km of the main North-South highway, the other side of which is Wami-Mbiki.